Five slender and red crowned cranes gather at the spring to enjoy its life-giving white waters. The cranes are in their distinctive black and white plumage, with their striking red crowns and red beaks. They stand in different poses, together, yet apart. The background is in very soothing green. Overall, the viewer is conveyed a serene and peaceful picture. This picture graces the cover of a Chinese language book published by Patridge of Random House in Singapore. 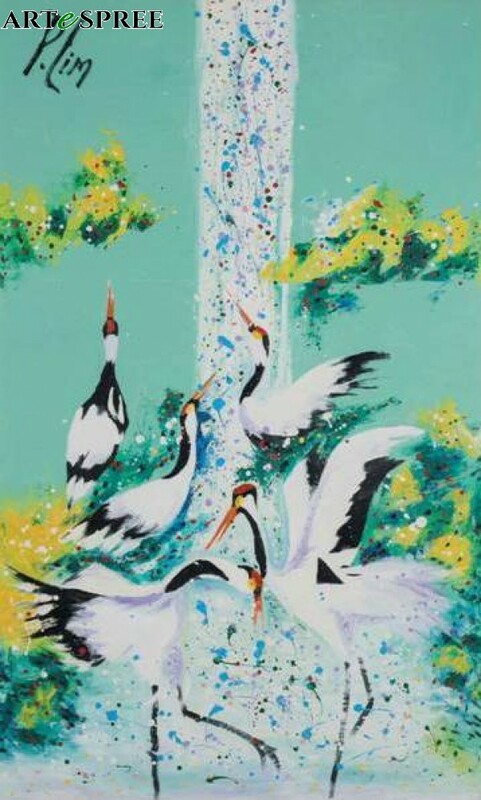 Five slender and red crowned cranes gather at the spring to enjoy its life-giving white waters. The cranes are in their distinctive black and white plumage, with their striking red crowns and red beaks. They stand in different poses, together, yet apart. The background is in very soothing green. Overall, the viewer is conveyed a serene and peaceful picture. This picture graces the cover of a Chinese language book published by Patridge of Random House in Singapore.